Shannon Green, one of Phoenix’s badge checkers on Redstone Arsenal, has been unable to walk since 2001. She doesn’t remember much, other than that she was in a horrible car accident. Shannon said she landed five feet from the car, sustaining severe injuries to her spine in the process. She is now a paraplegic in a wheelchair, able to move her arms but not her left hand or wrist. Of course, none of that has stopped Shannon from living life on her own terms. She was a 15-year-old sophomore at Sparkman High on the day of the accident. Two years later, she was back at school determined to graduate with her class. She doubled her class load and did just that. A few years after her accident, she learned about the Ms. Wheelchair Alabama pageant. She was drawn to the advocacy component of the event because of what she experienced firsthand. “My best friends didn’t know what to say to me,” Shannon said, recalling her return to high school. People were awkward around her. She sensed there was ignorance and fear about her condition. After winning the Ms. 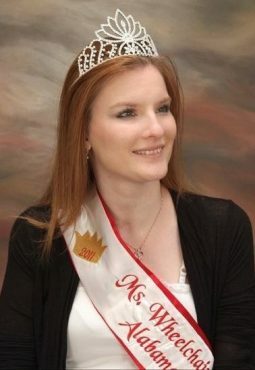 Wheelchair Alabama title in 2011, Shannon was able to travel the state and challenge others to look beyond a person’s limitations. Yet, she’s seen through the years that there is an on-going need to dispel the discomfort some have with people with disabilities. Prior to working for Phoenix, Shannon believes that she wasn’t hired for some jobs because of misperceptions about her abilities. Shannon has found another way to advocate for people with disabilities. Since 2016, she has been a wheelchair athlete. She “runs” in marathons along with other athletes – both with and without disabilities. Some of them are sponsored by Ainsley’s Angels of America, a non-profit based in Virginia Beach, Va., that promotes wheelchair athletics. Her husband Kevin is her “angel” in these races, pushing her in what she describes as an adult-sized stroller. He is her legs, she said.